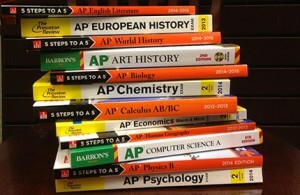 The College Board does not require a teacher to have any special qualifications to teach AP classes, but there are certain training resources that it highly suggests teachers of these classes participate in. These resources include professional development workshops, summer courses, AP exam readings and AP conferences. Even though teachers do not need to meet certain qualifications for the College Board, some states require teachers to attend one or more of these training programs before becoming an AP teacher. The AP Summer Institutes each cover one specific topic and are held at state colleges and universities. Because the courses take place at different educational institutions, the information presented may vary from place to place. The College Board does provide the materials and consultants to make sure the courses meet a certain quality level. Most of these courses cover topics about the AP exam, the AP course structure, available resources, how to teach students at lower levels, and improving AP classes already in place. The cost for these summer institutes varies from one college to the next, but the College Board offers free tuition for certain teachers whose schools do not cover the cost of professional development. Besides providing over 30 hours of training to potential AP teachers, the summer institutes offer a space for fellow teachers to share ideas and pertinent information about their specific AP course. The College Board also sponsors workshops for both AP and Pre-AP level courses. These workshops cover similar material taught in the summer institutes, but are not as in depth. Workshops are offered in numerous subject areas, including math, English, world language, science and history. At the conclusion of the administration of the AP exams every school year, a group of college and AP teachers gather to read and grade the AP free response questions. Some teachers choose to go to a specific location to participate in the AP Reading so they can exchange information with other teachers and with members of the AP committee. Others participate in the AP Reading from their own location using the Internet. Grading the free response questions using the given rubric helps AP teachers learn what the AP scorers are looking for in correct answers, which makes it easier for these teachers to grade their own students’ AP essays throughout the school year. The AP Conference is held once a year and includes members of the AP community, teachers, counselors and administrators. The conference features a lot of useful information and discussions for anyone involved in an AP course. New available resources, technology and books are put on display for teachers to discover ways to improve their AP class. The conference provides an environment for new and experienced AP teachers to share strategies and best practices. Teachers will also get access to the year’s AP results and have the opportunity to earn continuing education credits. Despite the fact that the College Board does not have specific qualifications to teach AP classes, teachers should research the requirements set up by their state’s department of education for AP teachers. Even if no requirements are in place in the state, it is beneficial for a new AP teacher to attend some form of training.